The blackboards in some of the narrow bylanes of Old Lucknow have a distinct charm. They have interested me since my childhood and even though the world has changed to blackberrys and bluetooths, the boards delivering messages still survive. The concept of leaving a note on the board for locals regarding any social gathering, public function or religious event apart from announcements of births, deaths and associated rituals, is quite useful. In one of the lanes in a ghetto in Old Lucknow, I have been noticing Shia and Sunni boards for years. The residents use chalk to leave the message for a 'milad' or a 'majlis' or any other ceremony. Mostly the notes are in Urdu and sometimes in English or Hindi. Though these message boards are found in other places also, the fact that no one ever leaves a misleading message or a prank, is even more surprising. In some cities that haven't seen huge expansion, the boards are placed at a prominent junction. Like in Burhanpur, the boards are placed at the Chowk so that every passerby gets the message about any happening. In some other places, there are drummers and announcers of unique accents using loudspeakers in auto-rickshaws to make announcements. The list of 500 most influential Muslims in the world had hit headlines in India due to the names of some celebrities. Though such lists shouldn't be taken too seriously, still, they do evoke interest. Many of these influential persons include monarchs and sheikhs of middle-east apart from heads of religious organisations and sects. Some of them haven't made much impact on public consciousness across the globe but have influence in their own countries and territories. However, like most lists that draw criticism and commendation at the same time, the Georgetown University's selection comprises a number of Muslim scholars, professionals, thinkers, doctors, experts in various fields et al. Importantly, the highest number of Muslims included in the list are from United States of Ameria  followed by Britain . The countries together make for over 100 personalities. And this is the positive aspect of the listing. The rankings are only for the top 50. Of the 10 Indians in the list the head of the Dawoodi Bohra communit Syedna Mohammed Burhanuddin, former President Abdul Kalam, Islamic scholar Wahiduddin Khan and preacher Zakir Naik are the notable ones. The names of Shahrukh Khan and AR Rahman, who have also been included in the list, were splashed in papers because of their celebrity status. Others are Maulana Mahmood Madani, Asghar Ali Engineer, Syed Ameen Miyan Qadri and Ahmad Sheikh Abu Bakr. There are 16 persons from Pakistan including Abdus Sattar Eidhi. Even Bilawal Zardari has found a place. The list has Muslims from almost every country ranging from Canada to New Zealand. Countries that make up for most personalities in the list inlude Iran 25, Saudi Arabia 24, Egypt 23, Turkey 20, Indonesia 15, South Africa 12, Morocco 11, Iraq 11, Jordan 10, Lebanon 10, Palestine 10 and France 5. Rest of the countries have less than five persons each in the list. There are biographies of the personalities making it to the top 50. All the 500 persons have been categorised as scholarly, administrative, political, preachers, women, lineage, youth, philanthropy, art & culture, media and even radicals. There are around 45 women. Though one can name many other individuals that have greater impact, the 2009 edition of the list, which is the first, and would become an annual feature, seems to be an interesting exercise. Read the entire list here. The photos add to its attraction. Senior journalist Santosh Bhartiya's hard-hitting articles in his weekly newspaper Chauthi Duniya kicked up a storm and some Members of Parliament [MPs] got so agitated that they succeeded in getting a privilege notice issued against him. The RS members--Ali Anwar, Sabir Ali, R Prasad and Aziz Pasha--were angry with the writer for using words like 'napunsak' [impotent] and 'shakti-vihin' [powerless] among others. But the result of the reports published in consecutive issues of the newspaper was that the MPs who generally remain silent, had to speak up and the government that had kept the Ranganathan Mishra panel report under wraps for years, had to announce that it would be tabled in the current session of parliament. Two years back, former Chief Justice Ranganathan Mishra had submitted this report on the status of religious and cultural minorities in the country but it was swept under the carpet. The report states that non-inclusion of Christian and Muslim Dalits in the category of Scheduled Castes that are entitled to job reservations, tantamounts to religious discrimination which is against he spirit of constitution. However, the stinging series of articles led to ruckus in Rajya Sabha and PM Manmohan Singh had to accept the demand to table it. It is noteworthy that Twocircles.net had already published the entire report. The members of Rajya Sabha, the Upper House of parliament, comprise of intellectuals, legal luminaries, constitution experts and eminent citizens chosen among senior leaders and public figures. It is felt that they would at least share a similar concern over the basic problems facing the nation and they would act as guardians of democracy rather than dalaals [power brokers]. But Rajya Sabha has become an assembly of the weaklings who can't raise voice or save the rights of the voiceless Indian citizen. Ranganath Mishra Commission was constituted before Sachar panel. Christian organisations had approached the Supreme Court that Dalits, irrespective of their religious affiliation should get the benefit of reservation and subsequently on SC verdict, the commission was constituted as per Commission of Inquiry Act. Though its report came after Sachar panel submitted its findings, the truth is that findings of the Ranganath Mishra commission report are an eye-opener. When the report was not tabled in parliament, the Chief Information Commisioner was approached. However, CIC's directive to the government was ignored and the Central govt went to court against the CIC order. It seems that the government is trying to hoodwink the Apex Court. November 24 would be remembered as Black Day in the history of Upper house as members sought that the report be tabled but it was not accepted. Twice the house was adjourned and then the members were given just two minutes each to speak. They said that the report had already been published in media, then why it is not being tabled. The Speaker was sitting on the chair first [later it was deputy speaker]. He comes from the same section but it seems after reaching this post, the Speaker has distanced himself from the poor and the weaker sections. Else, he could have easily directed the government to explain when the report would be tabled. The same day PC Chidambaram had presented the Liberhan commission report in the lower house. It had also been leaked two days back and published in a paper. Why Ranganath Misra commission report was not tabled then? There is a fine difference that needs to be understood. Liberhan commission was related to an emotive issue. However, Ranganathan commission report deals with the real situation at the grassroots in this country. By raising emotional issue, Congress wanted to put BJP in the dock. Ironically the party's role itself came under scanner. After all, in 1992 it was a Congress PM [PV Narasimharao] who was at the helm at Delhi. The tabling of Liberhan commission report has benefited BJP, that was appearing to be a divided house until recently. Had the Rajya Sabha chairperson ordered tabling the Justice Ranganath Mishra commission report in Rajya Sabha, it would have opened the doors of reservation to the Dalits among Muslims and Christians. ..................the Rajya Sabha members must realise their responsibility that they are sent to parliament by the powerless and poor to raise their voice. Do the RS members have any courage or conviction left, that they can force the government to table the report? If not, you must apologise to the nation. In the translated excerpts above, the words have been diluted. The MPs were upset and sought action against the journalist. However, the other result of the newspaper reports was that the same MPs did speak vociferously. Other parties including Samajwadi Party also joined in. Even the BJP demanded explanation and the opposition forced PM to state that the panel report would be tabled in this session. Interestingly, once again the Congress' Muslim leaders remained silent. Ali Anwar, Sabir Ali and Aziz Pasha are MPs representing JDU, Lok Jana Shakti Party (LJP) and Communist Party of India (CPI). The movement for reservation for Pasmanda Muslims is strongest in Bihar. [After independence Dalits or SCs who had for centuries suffered discrimination from Upper Castes were given benefits of reservation in jobs. However, a constitutional amendment was later made and neo-Buddhists were also extended the benefit. However, Muslim and Christian Dalits remained deprived. Middle-aged Laxmi Nirmala urgently required critical medical care and needed five injections, each of which costs Rs 25,000, but this wife of a mill worker had no means to arrange even Rs 5,000. She turned to the only man whom victims of gas tragedy approach. Abdul Jabbar, himself a gas victim, has all alone fought the nexus of corrupt bureaucrats, corporate brokers and the politicians who have over the last 25 years tried to silence the voice of the victims of the industrial disaster. Jabbar doesn't have money. But commands enormous respect because of his lifelong struggle. Perhaps, it is his extreme determination to fight for justice, that makes the bureaucrats work--either because they know that at least this man can't be 'managed'. Laxmi Nirmala got the injections and was saved. Raja Ram was unable to move and no hospital was admitting him but he intervened. Or take the case of young, 28-year-old Aqeel, who need dialysis every three days but was thrown out of BMHRC hospital that ought to provide it free of cost for life, Jabbar tries every method, even going up to Justice Ahmedi, who is chairman of the hospital trust, to get the man treated. In a society where people seldom speak for others, he has worked like a maniac. Today he suffers from various illnesses, is diabetic and is barely able to read even headlines of newspapers. He however has the moral authority that when he calls up--either the police chief or the minister--they do listen. During my first year in Bhopal as state correspondent for The Indian Express I was left bemused by the hostility and suspicion with which victims of the gas tragedy greeted the annual deluge of visitors from Delhi and abroad on the December 3 anniversary. By the time I left Bhopal I had come to share this attitude. It is not as if the victims do not need help. Each day more than 6,000 still seek medical aid for a host of respiratory ailments at designated medical centres. For them the process is an exercise in daily humiliation and there is almost none to help them out. The Monitoring Committee for Medical Rehabilitation of Bhopal Gas Victims set up by the Supreme Court in 2004, a full 20 years after the tragedy, has been without a chairperson for the last year and a half. Bhopal itself has two prominent organisations working for the victims. While both have moved the court in several cases to seek relief and justice, on the ground they operate in very different fashions. The Bhopal Gas Peedit Mahila Udyog Sangathan, led by Abdul Jabbar, focuses on helping the victims in their daily quest for medical help. The other, the Bhopal Group for Information and Action, led by Satinath Sarangi, focuses on efforts to inform the outside world of what is unfolding in Bhopal. Abdul Jabbar is a man who speaks little or no English, his organisation has very little presence on the Web, yet for the victims, he is the only one who can help out with their daily struggle. Satinath Sarangi is fluent in English, hosts a website that provides detailed information on every aspect of the tragedy and is the link between Bhopal and the outside world. 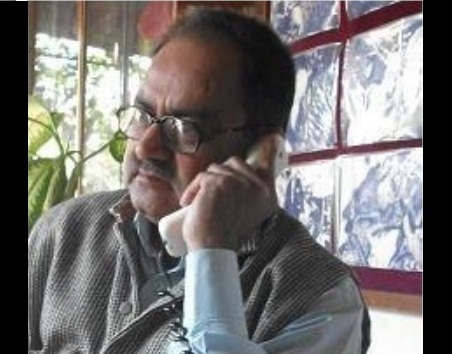 His work in Bhopal is limited to an ayurvedic dispensary. When I first reached Bhopal, I thought the two were an ideal foil for each other. But as is now common knowledge among activists, the two detest each other. Over the years this has resulted in the erasure of Jabbar’s role outside Bhopal simply because foreign correspondents, representatives of international NGOs as well as reporters from the English language Indian media reach Bhopal requiring pre-digested information. In the day or two they spend in the city they want their hands held by someone fluent in English who can mediate between them and the victims. Satinath fits this role perfectly, Jabbar doesn’t. In 2004, reporting on the twentieth anniversary for Tehelka, I wrote of my fear that the outside world would mistake Satinath’s message for the reality of Jabbar’s Bhopal. As if in confirmation a few years later, Indra Sinha published his book Animal’s People that places a character clearly based on Satinath at the centre of the victims’ struggle in a city based on Bhopal. A part of the proceeds from the sale of the book go to Satinath’s organisation. When I alluded to this problem in an earlier column, Indra Sinha weighed in with claims about the autonomy of fiction. But where events such as the Bhopal tragedy or the Gujarat riots are concerned, fiction loses its autonomy. No writer can claim he has the right to mould such material to his will. However reasonable the intention, a half-truth in this setting is an abomination with unfortunate consequences. The victims themselves can hardly raise money to support the organisations working in Bhopal, funds flow in from outside and they do not flow equitably. Thanks to patrons such as Greenpeace and Indra Sinha, Satinath is flush with funds, Jabbar has none. The money from the outside world goes mainly towards providing more information on Bhopal to the outside world while the man whose help the victims most need is left bereft. No doubt I will hear from many indignant activists, but don’t be fooled. The people who Jabbar helps have little or no access to the English media or the internet, they won’t be writing in. If you want the truth, don’t pay attention to those who parachute in for a day or two or those who claim to understand Bhopal from London, don’t even take my word for any of this. Go to Bhopal armed with a knowledge of Hindi and see for yourself. Allow yourself a month or two in the city to see how the victims who cannot obtain the medicine they need are helped by a story on the front page of the New York Times or a book on the Booker shortlist. Perhaps, you will also come to know why they remain sceptical of the hordes from outside who will descend to feast on another anniversary. For outsiders unfamiliar with the city, much of the focus of the work around the victims of the gas tragedy has been the efforts of international agencies and those working in collaboration with them. But for anyone who has actually lived in Bhopal, seen the smallest detail of painstaking relief and rehabilitation work being done there, the fact remains that the most effective work in the city is homegrown. Without doubt, it centers around the remarkable figure of Abdul Jabbar, who on his own has done more work of lasting value here than several such bodies as Greenpeace put together. It is a question often raised when such facts are brought up. But it is important to emphasise this over and over again. In this bid to put a united front on the work done in Bhopal, the contribution of Abdul Jabbar has been systematically overlooked or undervalued. Jabbar is a Punjabi who was one-year -old when his father moved to Bhopal in 1958. In 1984, he had a successful tubewell boring business in the city when the gas tragedy took place. His family was among those affected, and he continues to suffer the after-effects. Unable to devote himself to the business as he moved into the role of an activist, his business shut down. Ever since, he has been indefatigable. Through the Bhopal Gas Peedit Mahila Udyog Sangathan (BGPMUS), an organisation he set up in 1985, he has been involved with every important legal initiative taken up for the victims — from the compensation of victims to underwater contamination through the wastes lying at the Union Carbide site. But to anyone who has attended the weekly BGPMUS meeting at the Yaadgar-e-Shahjahani Park in Bhopal, far more unforgettable has been his contribution in helping out individuals who have no one else to turn to. Throughout old Bhopal tales of widows who have no-where to go, victims who cannot transport themselves to the ‘gas hospitals’, the elderly who cannot manage to fight their case for compensation in the courts are common. And there is only one person they can turn to — Abdul Jabbar. His obduracy, his willingness to take on anyone head on for such individual cases, has meant that the bureaucracy in the state, the unfeeling medical staff at the hospitals and the corrupt clerks who take their share of the compensation meant for the victims — they all know they should not take him on. It has meant that his name has become a byword for anyone seeking help in the city. That his contribution is not better known stems from a simple fact: his inability to cater to the requirements of the outside world. For a man always busy in the hectic course of each day, he has not been able to build up a record of documentation that journalists and activists outside the city expect to be handed to them when they waft in for a day or two. Neither does he have the fluency in English that seems a crucial requirement for most persons to be heard in Delhi or New York. And lastly, in the eyes of outsiders, he stands accused of the cardinal sin of self-respect. He does not kowtow to anyone and has always been far too involved in his own pursuit of justice to go out of his way to accommodate the ignorance of outsiders. The price he has had to pay for this is heavy. He does not mind that international recognition has come the way of others who are far less deserving. But it has meant that the most important relief effort in the city, the only one that can really provide succour, has been underfunded, if funded at all. For friends, it has been a common experience to chip in when Jabbar finds that the BGPMUS phone has been disconnected for non-payment of bills. For two decades his organisation has survived month to month, but it also speaks for his determination that of the nearly 50-odd workshops provided to ngos by the government after the tragedy only one continues to function and generate enough funds for itself. Again, no surprises: the workshop is run by the BGPMUS. The other workshops acquired in the name of ngos run by relatives and friends of those in power have long shut down. This post is a tribute to conscience-keeper like Abdul Jabbar, who devote themselves totally to a cause and live for others. There are several aspects of his personality. He hates self-projection. He also doesn't care about false and fat egos of journalists and has the moral strength to scold them without worrying that this might piss them off. Ironically the man and his immense contribution has not been acknowledged in an era when marketing, self-glorification and publicity create public images and undeserving people get undue credit. Either it's pursuing ongoing cases in the courts whether about gas tragedy or regarding lack of treatment in hospitals, the voluminous petitions and revised petitions are filed with the meagre Rs 5 collected from the volunteers who come on their own at the weekly meetings of his Bhopal Gas Peedit Mahila Udyog Sangathan. This was the third and the last post on Bhopal Gas Tragedy. Read the earlier posts 'Horrors of Bhopal Gas Tragedy 1984' and 'Injustice to victims, indifference towards survivors' on this blog. I don't generally write any post on the anniversary of Babri Masjid demolition. This year is no exception. However, I thought I could share this poem titled 'Common Pain' with you. ......but where is your qulfi box?" "Today they had demolished the Babri Masjid! Nasru replied in a choked voice"
December 6 is also the death of anniversary of Dr BR Ambedkar, an icon for most Indians, especially, the weaker sections--Dalits, Minorities and Bahujans. It's said that for a large section of India, 1992, is now history. It is also being said that we have moved ahead and there is perhaps a new generation that doesn't care about communal conflicts. The fate of those--The top ten--who were 'heroes' of the Ram Janmabhumi Movement and Save Babri Masjid campaigns is known to most of us. However, there has hardly been any justice for victims of the communal riots that had occurred in the country after the mosque was demolished. Also, there has been no action on the culprits of the Babri Masjid demolition riots. Two terms and the 'secular' Congress governments in Maharashtra still remain averse to action on even the Mumbai policemen involved in Hari Masjid firing and similar other incidents & even tries its best to shield them. Ayodhya remains a besieged City that has an extraordinary presence of the Men in Khaki. The make-shift temple is there but for devotees it is yet to become a trouble-free place. Should fear stalk devout in the City of Lord Rama! One hopes that as sanity returns, there will be national consensus and the issue is amicably resolved. Though there have been voices regarding national monument and hospital or construction of mosque nearby in the past, renewed efforts have begun recently, specially among Muslim intellectuals, who want the issue settled. On the left is the photograph of Ghazala on Eid in 1984. Just a few months later, she lost her vision and the toxic gas turned this bubbly and beautiful girl into permanently ill individual. Despite doing their best to get her treated and in process selling off whatever they had, her parents--who were also gas affected, died. Ghazala is just one of the innumerable individuals who lost their dreams forever on gas tragedy. The irony is that there are similar stories in thousands of households in Bhopal. when govt stopped counting the deaths due to gas and its after-effects. What is worse that even relief and rehabilitation was denied to majority of the survivors. Today, not just the after-affects linger, the diseases are passed on to next generations. More over, the huge toxic waste that hasn't been cleaned up in and around factory, has poisoned the soil and water. The contamination level is a whopping 60 times more in these areas. On the left is the photograph of the super-specialty Bhopal Memorial Hospital and Research Centre (BMHRC) that was established at a cost of Rs 175 crore, after the dollar 470 million dollar settlement between the Centre and multinational company, however, this sprawling hospital complex that is built over 150 acres is in a total mess. Of the 16 departments, just nine could be established. Gas patients that ought to have been treated free for life, are not given free treatment and asked to go elsewhere, costly medicines aren't given, no patient howsoever critical he may be, is admitted. On the contrary, private patients who can pay up are given benefits of this hospital. Besides, of the 133 posts of doctors, nearly 75 are vacant. All costly equipment that had been bought are getting rusted in this hospital. Strangely, neither state government nor the administration take any interest. Reasons are not far to seek. Wherever the upper class and the vocal or connected middle class goes, things do remain at least in a working condition. This is true for most govt hospitals in India, which are now frequented by poor, as the rest go to private nursing homes, which are well-maintained. The gas victims are mostly from the poor stratum. Naturally moneyed and salaried class goes to private hospitals and the govt hospitals in Bhopal are in a really bad shape. Activists and even journalists seem to have given up, as government doesn't bother. This is not just the tale of BMHRC. But conditions in the Indira Gandhi Hospital, Kamla Nehru Hospital, Shakir Ali Khan Hospital and Rasul Ahmad Siddiqui Pulmonary Centre that were all built specifically for the purpose, are even worse. The last, RAS Pulmonary Centre, was built because gas victims suffer from diseases of lungs and there are few specialists. The cruel joke is that today, this hospital has 'dentists' posted instead of the specialists who were needed for curing the critically ill. Even justice not just got delayed but was also denied. Whatever little compensation the victims got was too little and too late, obtained through 'dalaals'. When victims are poor, media also lose focus. Courts also go ahead only to an extent, as organisations fighting the case don't have money to hire the top lawyers. There is no public outrage as in the case of lobbying done by the vocal middle-class in Jessica Lal case or similar other high-profile murders. Mamta was just six when she got separated from her mother, who was running holding her youngest child. The baby died in arms and and she also died. Mamta grew motherless. Also a gas victim, with no money for treatment let alone education. Ruth Waterman, who had lost her parents in Hitler's gas chambers, and herself as a minor girl survived Holocaust, had met Mamta. It was Waterman who had created the sole monument ever made in the memory of gas victims. Her sculpture of universal mother with a baby in arms and Mamta [not visible in this view] clinging by the mother's dress, is symbol of gas tragedy. For 25 years no state or central government thought that there was need for any memorial. Suddenly there was a proposal to earmark Rs 116 crore for the purpose this year. And the bureaucrats for whom gas tragedy was disinteresting, again came back like 'vultures' to feast on the funds. In no other country, any public figure would have brazenly tried to speak against the interests of nearly half-a-million citizens and absolve the company it of its responsibility. [Dow Chemicals had taken over Union Carbide Limited]. However, Congress leader and spokesperson Abhishek Manu Singhvi pled the case for Dow. Nost just Kamal Nath, Montek Singh Ahluvalia but also P Chidambaram lobbied for the same cause.The chemical company has been shrugging all its repsonsibility towards cleaning the huge contamination, factory effluent, and toxic waste lying over an area of 67 acres in Carbide and around. Even though the case is sub-judice and despite the fact that it is well-known, the intense lobbying took place. It could shame everybody. *Dow chairman Andrew Liveris wrote to Indian Ambassador Ronen Sen that Union ministry for chemicals and fertilisers should withdraw its application for remediation costs. Soon the then Finance Minister P Chidambaram wrote to Prime Minister over the issue. *Montek Singh Ahluvwalia sent a letter to PMO explaining that it is not possible for DOW to come up with its proposed investment in India unless the liability issue is cleared. *Kamal Nath wrote to PM that resolving the issue was necessary to give the right signal to Dow, which is exploring investment opportunities in India. *Ratan Tata wrote to planning commission that it was critical for Dow to have the ministry withdraw the application for a financial deposit against the remediation cost. *Most recently Jairam Ramesh came to Bhopal, visited Carbide factory and stunned everybody by declaring that there was no toxic waste left, here. The Bhopal gas tragedy that had caused 3,000 deaths instantly and nearly 25,000 deaths over the next couple years apart from incurable diseases, physical and mental disorders to over half-a-million people, is nearly a forgotten affair today. It's India's shame not just because the main culprit, Warren Anderson, could never be arrested or extradited. It's also our shame because the ministers and bureaucracy has done its best to absolve the culprits and suppress the voice of the victims. After a quarter century, none of the accused could be sentenced or jailed as cases drag on. The apathy on part of Congress and BJP governments towards the fate of the survivors and whose children also suffer from disorders, is shocking. The pain and suffering is such that one might get insane just by a visit to any of these areas, and it's nearly impossible to write about it in a few pages. Nearly 40 tonnes of lethal Methyl Isocyanate had escaped from the Union Carbide factory in Bhopal. The pesticide plant was shifted from America because it was 'too risky' for Americans. In third world country, it was 'welcome'. Nearly a 100 safety standards were cut down in Bhopal plant as per directives of the company from its US-based head office. It was a strange night, which none of the citizens can forget. People woke up at night--coughing, vomiting and running--until they fell and died on the streets. Panic struck the entire city. The railway station was nearby and hundreds lay dead on the platforms as the killer gas spread across the capital city. Railway officials steadfastly did their duty, doing their best to inform the officials from Mumbai to Jhansi, to stop train traffic and not let any train reach Bhopal. There were no cell phones and no computerised signalling system. Most trains were stopped outside, except one [and most of the passengers onboard died]. But in the morning, 23 railway employees were found dead. Meanwhile, elsewhere in the city hundreds died in sleep. Others lay dead on streets. Throughout the night doctors tried to find ways to treat but there was no medicine for such a deadly chemical. Union Carbide officials said there was no antidote to MIC gas. Kids were dying in the arms of doctors. Those doctors who tried to resuscitate the children, themselves died as they came in contact with the gas. With the crack of dawn, the City was to come to terms with the gravity of the gas tragedy. In hospitals, there was nothing except bodies of men, women and children. The funeral pyres in shamshans kept on burning. Where were the qabristans for the thousands of dead? The special fatwa was issued for mass burials, so that dozens of Muslims could be buried in each qabr. Men and women were identified on the basis of their religions and last rites were performed as everybody volunteered to help. The Chief Minister Arjun Singh had already left Bhopal. Panic was further aggravated with the news that there is still gas in the tanks. Later there were statements that the remaining gas would be released. This led to greater panic and for weeks and months people kept leaving the city. Nearly 1,000 big buses were arranged by government to ferry people out. Others left on whatever vehicle they could and most ran on foot. This was one of the biggest mass exodus from a City in modern times, all because of absolute failure of government and administration. Trains passing through Bhopal wouldn't stop for long in those days. The train passengers would keep the compartments shut from within even though it was a common sight to see families and their children cry, begging them to open the gates. This was a tragedy of such magnitude that had no parallel in modern world. Then the legal battle began. A compensation was agreed upon. Contrary to perception, it was not at all sufficient. Suddenly dalaals [brokers] appeared. Whatever was the compensation given by Union Carbide, was not properly distributed. The real victims' money was distributed in parts of City where the gas had little effect, because of political considerations. The super-specialty hospitals built with the money meant for gas victims, are flush with funds, but don't provide treatment and medicines to the survivors. Instead private patients are entertained. The victims live in extremely polluted slums where toxicity is so high that young ones look middle-aged, thousands of women suffer from gynaecological complications and the poor have nobody to turn. The women widowed by the tragedy, live in the locality ironically named Vidhwa Colony, many of them barely getting barely a pension of Rs 150. Water is so toxic that none of us can imagine. Life remains the same for lakhs living in clusters like JP Nagar, Qainchi Chhola, Oriya Basti, Qazi Camp and numerous other slums-localities in the area around Union Carbide. The compensation had to be distributed among around 1.5 lakh people who were gas affected in 1984-85. Them and their children together numbered nearly 2-3 lakh by the next decade. However, to gain political mileage--the compensation that was meant only for the victims, was distributed in New City also, ahead of elections. Not many got compensation over Rs 1 lakh. As a result the real victims got much less of what they would have otherwise got. Compensation was distributed among 5 lakh people. Though it was a pittance--just Rs 25,000. Had the 25,000-each given to 4 lakh-odd non-victims, kept for the gas victims, the real victims could have benefited. But even this colossal human tragedy was communalised. In the aftermath of Babri Masjid-Ram Temple dispute, a campaign to get compensation to New Bhopal residents was launched. 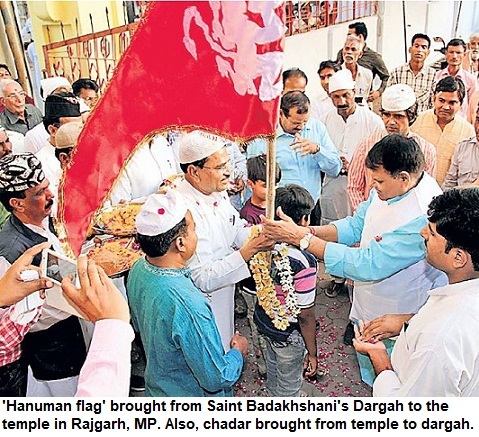 The hidden message was that it was the Muslim-majority Old Bhopal that had got money. Ironically, this was also untrue. Though Walled City in Bhopal has a clear Muslim majority, the areas that were affected had a predominant Hindu population. 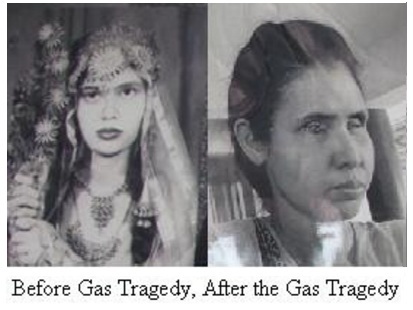 Among the gas victims, over 62% were Hindus, who were migrant labourers and poor workers. But this ploy did work. The Union Carbide was bought by Dow Chemicals. There was a large quantity of poisonous waste in factory, which remains to this day. The factory had to be cleaned up, as the waste is polluting groundwater in the entire area, causing deadly diseases and producing generations that are frail and always ailing. Bureaucrats including many senior IAS officers were interested in Gas Relief ministry and its projects as long as funding was there. When hospitals were being built, they were happy as contracts were awarded for everything from construction to buying of equipments, and they got 'cut'. There was money in everything: even in calling companies to remove toxic waste remaining in factory. When the hospitals were established, they lost interest--so what if doctors were not appointed and machines remained unused, even patients turned away, emergency and OPD kept shut at night--after all, there was no money for them now. A strategy was devised to hush up each and every issue. Everytime a high-flying minister from Delhi would come, he would say that there was no waste, no pollutant and nothing needed. After all, the victims were mostly--poor, unable to fight cases, not like us--and could be ignored. It was long back that governments had stopped medical studies. Those who died due to after-effects of the gas tragedy, were not counted after 1990. The true figure of deaths could be anything from 50,000-1 lakh and even more. The reports that indicated governments and highlighted the presence of extremely toxic substances, were not 'accepted'. Bribe was paid, Carbide was let off and leave the country. The ugly corporate-bureaucrat-minister nexus worked wonderfully for the killers. They shouted from the rooftop that there was just 360 tonnes of toxic waste left. For decades carbide had functioned in Bhopal. The reality is that the premises--67 acres has nearly 8,000 Metric Tonnes of the most poisonous chemicals' concoction in the world, buried in the ground, that is killing the poor in the adjoining areas. And a further, 10,000 Metric Tonnes, is buried in the nearby open land where the effluent was dumped for years. And nobody would talk about it. After all, the poor can be allowed to drink this poison. Who cares? They don't get treatment. Who cares? They die. Who cares? Of course, a few do. Next part tomorrow. After taking as much time and causing as much delay that was possible, the report of the commission probing the Babri mosque demolition, is finally with the government. Particularly, when the political climate is absolutely in Congress' favour and the party doesn't have to face elections for a long time, Retd Justice MS Liberhan has submitted the report that cost us over Rs 15 crore. Many of us feel it's futile to discuss the Ram Janmabhumi-Babri Masjid dispute and the Ayodhya movement now when the nation has moved forward, but it is still pertinent to set the record straight. We believed that it had to be a pro-Congress report and that's what the honourable judge has delivered. The truth is that PV Narsimharao, his Home Minister SB Chavan and the Muslim leaders of Congress were responsible for the demolition of the mosque. Narsimharao was the supreme architect. The shrewd man let 'things take their own course' and found no reason to invoke president's rule when North India was boiling, though he immediately after dismissed the BJP governments in even MP and Himachal Pradesh for no apparent reason. Narsimharao lied to the nation. He promised on live television that the mosque would be rebuilt, but gave ample opportunity to the Kar Sewaks to build the make-shift temple, and in process hurt the confidence of millions of Indians in the government and the official machinery. He would not have been able to do so, had the Ministers in his government taken a firm stand. But the 'qaum farosh' leaders showed little remorse or action. Ministries were more important than the mosque or the faith of the minorities. Worse was to follow. Riots were engineered in Mumbai (and Surat) and Congress CM Sudhakar Rao Naik let the Shiv Sena mobs go on rampage in the metropolis. Narsimharao represented the right-wing constituency within the Congress that existed from pre-independence era. As long as Nehru remained alive, he managed to keep them under check [to an extent] but leaders like Sampuranand, Purushottam Das Tandon, Govind Das and others were no less fundamentalist than the Togadiyas and Singhals of today. In fact, the 'right-wing leaders' within Congress were much more intelligent and fundamentalist than those in BJP and even VHP today. They caused greater damage though spoke little. The manner in which not a single Muslim was appointed in UP police from 1947 to 1967 or the total abolition of Urdu from UP are just a couple of examples of this brand of Congress' communalism in the past. It was this right-wing group within the Congress that was instrumental in keeping the communal cauldron boiling. In mid-80s, it reached it's peak. One positive aspect of the Ayodhya movement is that it not just gave strength to BJP but also ensured that such right-wing hardliners of Congress either got exposed or joined the BJP. At least, 17 years after demolition of Babri Masjid, Congress is not left with any strong fundamentalist lobby within its organisation. It is back to the centrist path. And there is a distinct right-wing [BJP] that has also diluted its position, due to its strategic alliances [JDU etc] and electoral reversals. Some would say that India has also changed. And where are the commanders of the demolition squad and those who gave war cries in that post-Rath Yatra period, today? 8. Syed Shahabuddin, once the mascot of Muslim politics, is not even on the periphery. No one bothers about him. Mercifully, there is no talk of such dreadful and confrontation-oriented Muslim leadership in the country. 9. Obaidullah Khan Azmi has no takers now. 10. Murli Manohar Joshi. Who is he? And an important point that one might forget is that, Atal Bihari Vajpayee, the sole BJP leader, whose statements hardly came during the entire period, had emerged among the other leaders, to become the Prime Minister of India. This is a much better situation than the era when Congress was the only major political party but it used to have a very strong right-wing lobby apart from other openly anti-minority parties like Hindu Mahasabha. Congress-led state governments may not have be too secular or active, but at least, they are now forced to act in case of communal riots, that were earlier an annual feature through out the country. Earlier, Congress' position was that it dictated terms and instilled sense of fear among Muslims. Its leaders felt that Muslims can't desert it and even if if they do, it will remain in power. Despite riots and absolutely no schemes for empowerment of Muslims, it blackmailed the Muslim electorate. Credit goes more to the secular silent majority, the Hindu masses, who understood the designs of those who turned Maryada Purushottam Lord Rama for political gains and to divide the nation on religious lines for the sake of power. From 1986 onwards until 1992, the anti-Muslim feelings were stoked and fiery speeches were delivered on a daily basis across the country. I remember the days when bricks carrying the name of Lord Rama were carried by Kar Sewaks and fiercely anti-Muslim slogans were raised. I recall the public meetings and rallies were they would openly charge Muslims of everything bad that happened in this country. It hurt badly when one heard the term 'Babar ki Aulad'. It was all happening openly and almost everywhere. Ritambhara, Uma Bharati, Kalyan Singh, Vinay Katiyar, Mahant Avaidyanath and Ashok Singhal abused Muslims in rallies in each and every town in North India. But no Indian Civil servant dared to take action--either registering cases for inflammatory speeches or booking them under the provisions of Indian Penal Code for spreading communal hatred. The bureaucracy was the silent accomplice. I must again reiterate that politicians, at least, have to face the voter every couple of years and also face anger of the society, but the bureaucracy that is educated and ought to uphold law and order, cunningly give the impression that the politicians rule the roost. On the contrary the bureaucrat lets things worsen and also escape any criticism or public scrutiny. The collapse of the system is more because of the impotent and complicit bureaucrat. In 1984, Delhi was burning following the death of Indira Gandhi. Yes, Congress politicians were responsible. But where was the police officials and the district administration? Who held the officials responsible? Did any of them got punished? The same was the case with 26/11. Not a single official got suspended. It is absolutely unbelievable situation. Power without any accountability. And Indian babudom has developed this system to perfection. The society just doesn't consider them accountable. Lot more can be said on the subject but I think this post is long enough to put a full stop now. This is a couplet that is recited by heads of states and is heard in speeches in parliaments but the poet is not as widely known. Translation is impossible as the beauty of the couplet can't be translated in another language though it means that 'History has been a witness to this tragedy that mistakes of moments have brought sufferings to mankind for millennia'. Like several other popular and oft-repeated couplets, it has also acquired a unique status and is used to describe decisions [like partition] that altered the course of history and changed destiny of countless citizens for centuries. Interestingly, poet Muzaffar Razmi, 73, is alive and lives in his hometown, Kairana, a prominent town in Muzaffar Nagar in Western part of Uttar Pradesh. The couplet is part of the ghazal that has five 'ashaar' but other couplets of the ghazal are hardly known. In the words of eminent poet late Rafat Sarosh, this couplet that was written in a moment of almost divine revelation, expresses the essence of mankind's experiences over several millennia. Good couplets travel fast across the world. 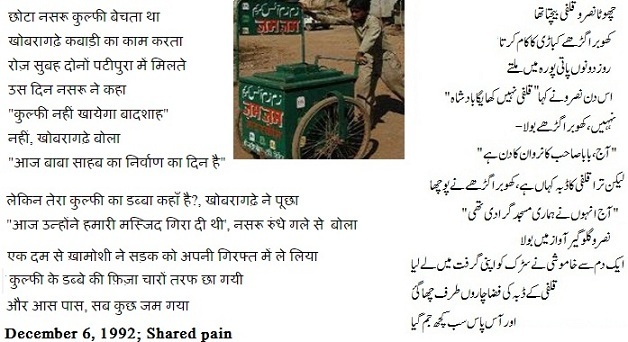 Razmi's couplet was first recited on the Urdu Majlis programme of All India Radio, many decades ago. It got instant popularity and turned into a 'zarbul misl' sher that is quoted quite often in conversations and conventions. Had Razmi been living in Delhi or Mumbai, TV crews would have queued up at his residence for interviews. But he lives a contented life in his hometown. His collection of poetry was released by Prime Minister sometime back. However, Muzaffar Razmi Kairanvi is at least fortunate that in his life time he is admired in poetry circles to some extent and is known as the man who wrote this couplet. Many other poets didn't live enough to see their poetry or couplets get such popularity. Muzaffar Razmi passed away in his hometown Kairana on September 19, 2012 after a brief illness. Razmi was 76. He is survived by three sons and two daughters. 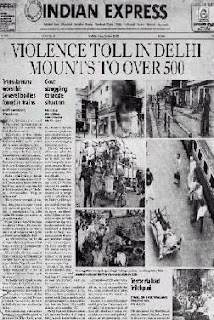 A quarter century has elapsed since the horrific anti-Sikh riots had engulfed parts of North India including Delhi. Though it seems ages ago, but to my mind, it's still fresh. Circa 1984: The All India Radio blared news about skirmishes between militants and police in Punjab on a regular basis. Just two years ago the grand Asiad had excited Indians and TV was slowly becoming a part of every urban household. Fortunately or unfortunately there was no concept of live TV news. As a result, the images of neither the damage to the Golden Temple during the army operation nor the widespread carnage in national capital could be seen in rest of the country. My first memory is fire in the building behind my house in New Bhopal. A tent house owned by a Sikh was set afire and the flames had spread to the entire structure. It was a horrifying scene but youths seemed enjoying the sight. The middle-aged Sikh gentleman in our locality had got a haircut to avoid the gazes. And there were groups of youths on the prowl. In Gwalior, the situation was even worse. The eateries and dhabas run by Sikh [refugee families who had settled here] were either ransacked or burnt. In Rae Bareli, Kanpur, Hardoi and other neighbouring districts in UP which I passed through a few days later, the talk on the streets would be like--'we saw a Sikh driving a truck in that direction' or 'at that place a Sikh family was cornered' and 'taught a lesson'. And this was the situation hundreds of kilometers away from Delhi, where the real massacres took place. My worst experience was seeing the trauma of 'daarji' [my father's friend] and his family. His son called him 'daarji' [shorter version of Sardarji]. He was born and brought up near Lahore. After partition, he had migrated to Indian Punjab and later came to Central India. When we visited his home soon after the riots, the entire family was huddled in a room on the backside, almost scared to death. Their house was attacked thrice in a week--all by 'civilised', educated neighbours and local boys. They were so scared that only when the policeman deployed at their residence yelled a couple of times, they came out and opened the door of the backyard to let us in. They were all shaken. He tried all contacts when his house was targeted, but to no avail. Friends had stopped taking calls and even a senior police official close to him, hadn't been enthusiastic about providing security. After repeated attacks, the family had run to a gurudwara and took shelter. When they returned, they would rarely venture out. Their trauma was all the more worse because like most of the Hindu families in Punjab, they also had both Sikhs and Hindus in the same clan. In many Hindu families, the eldest son was asked to follow the path of Sikhism. So 'Daar ji' became a Sikh, while his brothers remained Hindu. Outside Punjab, it was not widely known and people often expressed surprise. I can never forget their faces--the couple breaking down every now and then, the pale horror-stricken faces of their daughters. 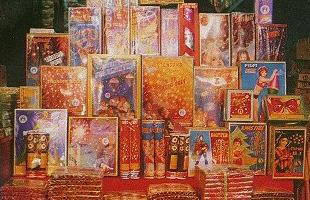 Especially, when he would cry and say--'Unhon-ne Guru Granth sahab ko jala diya, sab se zyaad to usmein Ram ka hi naam likha hai' [They set fire to the Guru Granth Sahib, that mentions the name of Lord Rama most]. Time is a great healer. 'Daar ji' kept getting promotions and was attached to Chief Minister's office. But he could never come out of the trauma fully. The anti-Sikh pogrom in which thousands of innocents were killed, was shamelessly concealed by the state-run Doordarshan and Akashwani. Then elections were announced. Soon the TV was suddenly showing movies through out morning. In those days it was too tempting and I recall watching flicks of Raj Kapoor, Sanjeev Kumar, Rajesh Khanna and lot of other stars. Then, there were no CD-DVD players or cable TV and the movie bonanza kept the citizens hooked. The atmosphere was euphoric. Rajiv had heralded a new era. Sikhs, the protectors and defenders of Hinduism, had been suddenly been turned into villains. The sorrow of the widows and the cries of orphans didn't matter then. After all, 'a tree' had fallen and the 'tremors' had to be felt. Who expected justice in that atmosphere? Was it the misdeeds of two guards for which millions paid the price. Or it was the Congress' policies that turned the hero of Bangladesh war, Major General Shahbeg, to turn a rebel and die fighting against the same army? To whip up passions and win elections, the communal and linguistic cards were played time and again in Punjab. A couple of years after the carnage, the demand for justice was raised forcefully. Some families did get compensation. Militancy again got a filip and it took many years before normalcy was restored in Punjab though the communal harmony and bonding in the society was severely affected by then. However, the big fish remained scot-free. One wonders if such horrors were possible if there was 24/7 television then. Nobody knows. Though AIR and DD had 'managed' the situation too well for the Central government then, still there were many rebellions in army camps across India, that were not reported then. It could have been far worse for the integrity of the nation or the deteriorating situation may have been controlled much earlier. It was later said that the anti-Sikh violence could be the last major communal conflagration of such magnitude in independent India. But in live TV age, there was the anti-Muslim pogrom in Gujarat, once again reminding us about the mob mentality in us [our society]. Those who won't dare to take a step for for others or speak a word in ordinary times, turn killers when they are part of mob and they suddenly have their sight on the greater common cause. Software, Sensex and Swanky SUVs are fine but no society can claim to be truly progressive until it remains unrepentant and fails to learn lessons from the past. In a way 1984 seems distant past. In a way it's yesterday. The recent conclave of the All India Shia Personal Law Board [AISPLB] has brought to fore several issues, which are often overlooked. The fact that Shias comprise anything between 10-17% of Indian Muslim population, which is around 2-3 crore [20-30 million] and are numerically equal to the size of Sikh and Christian minority, can't be ignored. However, they don't have any political representation and there is probably no Shia Member of Parliament (MP). This was the main issue, which came up for discussion. The participants said that while the voice of mainstream Sunni Muslim is heard in the echelons of power, the problems pertaining to the Shia sect aren't discussed or redressed. Just a couple of states have separate Shia Waqf Boards. The education backwardness of Shias was another major issue. Interestingly, while there is no dearth of prominent Shia public intellectuals, authors, journalists and activists--from Raja Mahmoodabad to Rahi Masoom Raza, who dominated public space, the fact remains that generally the condition of Shias is worse than the Sunnis. 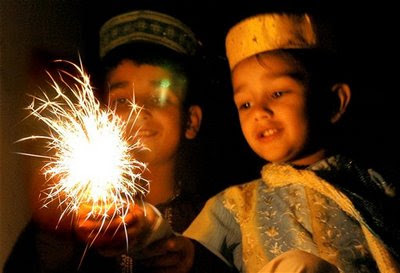 Historically, the towns where there was a substantial Shia families, the prominent leaders came from the few elite families but rest of the Shia populace remained trapped in poverty and educational backwardness, especially in semi-urban and rural areas. Though there is no clear breakup of Shia populace available, the distribution of population of Indian Shias is another unique demographic phenomenon. There are concentration areas in UP and Karnataka apart from Bihar and parts of Jammu-Kashmir. In UP, the population of Shias is higher in and around Allahabad region [contrary to general belief about Lucknow, which too has a sizable Shia concentration]. However, it is in middle-level cities and towns across UP--from Amroha to Nauganvaan Sadat where the Shia culture exists as a minority within a minority. Besides, some other sects including the Ismailis and the comparatively much more progressive, prosperous and educated Dawoodi Bohras are also part of the Twelver Shiites [Asna Ashri Jamaat]. The Bohras who are mostly concentrated in Gujarat, Maharashtra and Western Madhya Pradesh [Malwa region] number well over 1 million. Though there has been Shia-Sunni schism elsewhere, India has never had such a conflict except for a period in Lucknow where certain old rivalries caused hostility among the two groups of Muslims. Perhaps, there is a bit of justification in the grievance among Shias that the mainstream Sunni leadership and MPs-MLAs aren't concerned about them much. The Shia personal law board, which was not taken seriously earlier, has now delivered a message at the convention in New Delhi. Mirza Athar's statements regarding the lack of representation of Shias in political parties and the government was viewed by some sections as an attempt to carve a separate identity for the Shia Board as also enhance the clout of the Shias. He said that the Shias are spread across India unevenly and are not concentrated in any particular region. Thus they are not treated seriously [read vote banks] and the parties ignore them. Congress leader Digvijay Singh said that he was not aware about the problems of the Shia sect and assured that the demands would reach the leadership. The Congress-NCP are all set to form the next government once again in Maharashtra. In the important yet tasteless election that hardly offered any other choice to the voters, the Congress-led coalition was heading for a third straight victory. The trends from the morning were clear. Not just Raj Thackeray's MNS had made an impact and divided the Shiv Sena-BJP's vote, the Congress-NCP had also managed to hold its traditional base of Marathas, Muslims, Dalits and Tribals apart from the North Indian voter. Despite its less than impressive record, the Congress-NCP combine have managed to retain Maharashtra--one of the most important states in India. Clearly, there was no other fresh alternative. Congress would be more than delighted with the outcome of the results. For the electorate it was not an election to look forward to. The ruling alliance had performed badly in terms of governance during the last regimes. The Congress wanted to cut Sharad Pawar to size. However, the Maratha strongman has once again proved that he is a force to reckon with and his fortress remains invincible. The other group had a regressive ideology and offered nothing new despite Uddhav Thackeray's less-rabid Hindutva. Maharashtra Navanirman Sena rocked the boat for BJP-SS but with his divisive agenda, he seems to have struck chord with a section of voter and in process ensured that Shiv Sena failed to win once again. Despite the aging Bal Thackeray's impassioned appeal to Marathi Manush, the Sena has faltered once again. It might remain a force in Mumbai metropolis due to its hooligan ways but it can't capture power. And as political observers say, it's extremely difficult to run a regional outfit if you are out of government for over a decade, as you face a severe fund crunch. 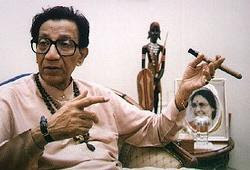 Raj has appropriated the legacy of Thackeray. For the BJP-Shiv Sena it's a time for further reflection. If the MNS had cut into BJP-SS votes, for the Congress-NCP there was anti-incumbency and the Third Front. After Vilas Rao Deshmukh was replaced post-26/11 Mumbai strikes, the clean image of Ashok Chavan also seems to have helped the Congress. There could be all sorts of analyses. Though BJP was also divided between Nitin Gadkari and Gopinath Munde, the Congress had to brave a very strong anti-incumbency wave. Still, the Mahrashtra electorate chose Congress over the other coalition. The victory in this Vidhan Sabha election makes it a third consecutive win for the coalition. The election results and trends show that Cong-NCP may get a simple majority on their own. The recent blast in Goa's Margao and the recovery of more explosive devices (IEDs) in Sancaole has once again brought spotlight on the fringe organisations that are involved in terror attacks in the country. The name of Sanatan Sanstha that has come up in the course of investigations, has been linked to blasts man times in the past also. This includes blast at a theatre in Thane and explosions in Vashi and Panvel. Besides, the group is linked to another hardliner group--Abhinav Bharat that was responsible for the Malegaon blasts. Any fundamentalist group belonging to any religion can have some sick and fanatic elements. However, the problem begins when there is reluctance among officials and the leadership in accepting that certain organisations can be involved in terrorism. After the Goa blast, the headlines in channels and newspapers read like--'Extremist group involved', 'Sanatan activists quizzed' or 'Hindu group blamed'. Not once the word 'Terror' was used. Those arrested were termed 'activists' or 'suspects. Besides, the use of word 'blame' in headlines is in sharp contrast to the otherwise 'judgmental reporting about terrorists caught, as per police version even when there is no blast'. It is also wrong to associate terror with religion. In fact, in all such cases, the word should be terrorist, rather than Hindu or Muslim. Any group belonging to any religious community can have fanatic elements. Just like SIMI and the terror outfits with foreign support that have created terror in our country in the past, there are dozens of extremist organisations from Assam to Punjab and Manipur to Jharkhand. They could be Maoists or right-wing Hindu groups. Hate can consume anybody. Early this year a right-wing activist was caught for injecting a Christian priest with poison-filled injection. We can only imagine that how strong must be his conviction or the motivation to fight the evangelists. And the 'man' who shot only those Muslims who married Hindu girls. And there were Abhinav Bharat activists who were targeting Muslim cogregations and Churches. Not to mention, the procurement of RDX and the arrest of even an armyman [Colonel Purohit]. What is needed is that there should be tough action and similar nomenclature for all groups that are involved in disruptive activities. 1. 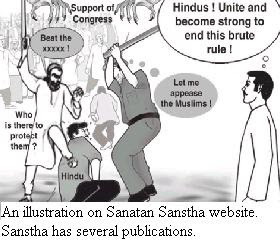 Preliminary investigations have revealed that the Sanstha's activists were involved in the recent communal riots in Miraj and Sangli just before the Maharashtra elections. 2. After Hemant Karkare's death, the investigation into the activities of the 'right-wing' terrorist groups came to a dead-end. Karkare had stumbled upon the network and the modules spread across Maharashtra and neighbouring states including MP and Karnataka. But a campaign to defame him was begun soon after he had begun the ATS' operation. 3. Blasts and attacks on mosques in Parbhani, Jalna, & Purna towns of Maharashtra, targeting towns like Malegaon, Modasa and attacks on Khwaja Moinuddin Chishti's shrine in Ajmer apart from Mecca Masjid and the Samjhauta Express had pointed to the direction of the right-wing terrorist organisations. 4. 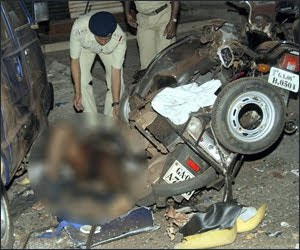 Malgonda Patil who died in the blast was expert in assembling bombs. The investigating team has reached Nagpur after they found that the gelatin sticks were brought from Maharashtra. Samjhauta Express blast case solved: Planned in Indore! Police teams of several states including Haryana and Rajasthan who were probing the attack on train, have finally zeroed in on the extremists in Indore. Local newspapers have revealed that the organisation members killed one of their own, RSS activist Sunil Joshi, so that the police couldn't reach them and bust the network. Still, the bags used in carrying bombs in the train and other clues had taken police to Indore. A BJP leader's brother has been found involved in financing the bomb-making, reports an Indore based mass circulation evening newspaper. See the front page of the newspaper and the investigative report.